• there are two foci that lie on the major axis, each a distance ae from the centre of the ellipse, where e is the eccentricity of the ellipse; note that the foci are in the plane of the ellipse, and that e = 71 - b2/a2. The eccentricity is a measure of the departure from circular form. If e is zero, then the foci coalesce at the centre, a equals b, and the ellipse has become a circle of radius a. If e approaches one then the ellipse becomes extremely elongated. Figure 1.8 The orbit of Pluto. is at one of the foci, is distinctly off centre. Note also that the semimajor axis is less than the maximum distance of a body from the Sun, but is greater than the minimum distance, and it is therefore some sort of average distance. At its greatest distance from the Sun the body is at a point in its orbit called aphelion; the closest point is called perihelion. These terms are derived from the Greek words Helios for the Sun, and peri- and apo- which in this context mean 'in the vicinity of' and 'away from' respectively. The length of the semimajor axis of the Earth's orbit is called the astronomical unit (AU), mentioned earlier. Kepler's laws don't apply just to planets. Figure 1.7 is in fact the shape of the orbit of the comet 21P/Giacobini-Zinner (Table 1.4). □ Where should the Sun be marked in Figure 1.7? The Sun should be shown at either one of the two foci. This is an orbit of fairly high eccentricity, e = 0.7057. The non-circular form is now very clear, and the foci are greatly displaced from the centre. Kepler's second law tells us how a planet (or comet) moves around its orbit. For the case of Pluto the shaded areas within the orbit in Figure 1.8 are equal in area, and so by Kepler's second law these are swept out in equal intervals of time. Thus, around aphelion the body is moving slowest, and around perihelion it is moving fastest. The difference in these two speeds is larger, the greater the eccentricity. 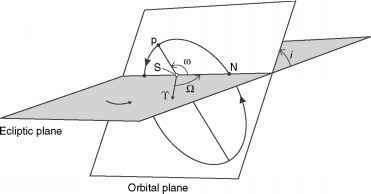 □ What are the speeds at different positions in a circular orbit? In a circular orbit the equal areas correspond to equal length arcs around the circle, so the body moves at a constant speed around its orbit. Kepler's third law If P is the time taken by a planet to orbit the Sun once, and a is the semimajor axis of the orbit, then where k has the same value for each planet. P is called the orbital period or the period of revolution. It is the period as observed from a non-rotating viewpoint, which, for practical purposes, is any viewpoint fixed with respect to the distant stars. This leads to the term sidereal ('= star-related') orbital period for P. For the Earth this period is called the sidereal year. Therefore, with P = 1 (sidereal) year and a = 1AU, k = 1 year AU-3/2. According to Kepler's third law, this is the value of k for all the planets. Equation (1.3) tells us that the larger the orbit, the longer the orbital period. This is partly because the planet has to travel further, and partly because the planet moves more slowly. We can see that the planet moves more slowly from the simple case of a circular orbit of radius a. The circumference of the orbit is 2^a, so if the orbital speed were independent of a then P would be proportional to a, not, as observed, to a3/2. Therefore, the orbital speed must be proportional to a-1/2. In an elliptical orbit the circumference still increases as a increases, and now it is the average speed that decreases. If one of the two bodies has a in AU, then we can express the other semimajor axis in astronomical units. This can be repeated for all orbits. Moreover, from the shape and orientation of the orbits, we can draw a scale plan of the Solar System, and at any instant we can show where the various planets lie. At any instant we can thus express in astronomical units the distance between any two bodies. If at the same instant we can measure the distance between any two bodies in metres, we can then obtain the value of the astronomical unit in metres. Today, the astronomical unit is best measured using radar reflections. Radar pulses travel at the speed of light c, which is known very accurately (Table 1.6). Time intervals can also be measured very accurately, so if we measure the time interval At between sending a radar pulse from the Earth to a planet and receiving its echo, then the distance from the Earth to the planet is cAt/2. Accurate measurements of distances in the Solar System have revealed that the semimajor axis of the Earth's orbit is subject to very slight variations. As a consequence the AU is now defined as exactly equal to 1.4959787069 x 108km. The Earth's semimajor axis is currently (2006) 0.999 985 AU. The asteroid Fortuna is in an orbit with a period of 3.81 years. Show that the semimajor axis of its orbit is 2.44 AU. • from the radar data calculate the distance in km between the Earth and Venus. Hence calculate the number of metres in 1 AU. Note: For two-significant-figure accuracy Venus is sufficiently close to perihelion when the Earth is at perihelion for you to use the perihelion distance of Venus. The quantities a and e are two of the five quantities - of the five orbital elements - that are needed to specify the elliptical orbit of a body. P is not normally among the three remaining elements. Figure 1.9 The three orbital elements i, w, ft, used to specify the orientation of an elliptical orbit with respect to the ecliptic plane. moment in the year provides a reference direction. The direction chosen is that from the Earth to the Sun when the Earth is at the vernal (March) equinox. The direction points to the stars at a location called the first point of Aries. The direction (and the location) has the symbol T. The basis of these names will be given later. For the other body in Figure 1.9, its orbital plane intersects the ecliptic plane to form a line. The Sun lies on this line at the point S - the Sun must lie in both orbital planes (Kepler's first law). Another point on the line is marked N, and this is where the body crosses the ecliptic plane in going from the south side to the north side, north and south referring to the sides of the ecliptic plane on which the Earth's North and South Poles lie. N is called the ascending node of the body's orbit. The angle ft is measured in the direction of the Earth's motion, from T to the line SN. This is the orbital element called the longitude of the ascending node. It can range from 0° to 360°. The orbital plane of the planet makes an angle i with respect to the ecliptic plane, and this is the element called the orbital inclination. It can range from 0° to 180° - values greater than 90° correspond to retrograde orbital motion. □ What is the inclination of the Earth's orbit, and why is the longitude of the ascending node an inapplicable notion? The Earth's orbit lies in the ecliptic plane. With the ecliptic plane as the reference plane, the inclination of the Earth's orbit is therefore zero. An ascending node is one of the two points where an orbit intersects the ecliptic plane. The Earth's orbit lies in this plane and therefore the ascending node is undefined. The last of the five elements that are needed to specify the elliptical orbit of a body is the angle w, measured from SN to the line Sp, where p (Figure 1.9) is the perihelion position of the body. The angle w is measured in the direction of motion of the body, and can range from 0° to 360°. It is called the argument of perihelion. However, it is somewhat more common to give as the fifth element the angle (ft + w). This is called the longitude of perihelion. It is a curious angle, being the sum of two angles that are not in the same plane. Note that if the sum exceeds 360°, then 360° is subtracted. To specify exactly where a body will be in its orbit at some instant we need to know when it was at some specified point at some earlier time. For example, we could specify one of the times at which the body was at perihelion. This sort of specification is a sixth orbital element. • except for Pluto and Mercury, and to a lesser extent Mars, the orbital eccentricities are also small, and the exceptions are not dramatic. (b) The distance of Comet Kopff from the Sun at its perihelion on 2 July 1996 was 1.58 AU. Calculate the semimajor axis of the orbit, and hence calculate: its aphelion distance, its orbital period, and the month and year of the first perihelion in the twenty-first century (given that there are 365.24 days per year). Nearly all of the asteroids are in a belt between Mars and Jupiter, and though their orbital inclinations and eccentricities are more diverse than for the planets (Table 1.3), the asteroids in the asteroid belt do, by and large, partake in the nearly circular swirl of prograde motion near to the ecliptic plane. 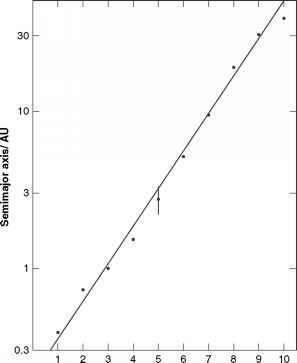 If we compare the semimajor axes of the planets, and include the asteroids, then something curious emerges. One way of making this comparison is shown in Figure 1.10. The planets have been numbered in order from the Sun: Mercury is numbered 1, Venus 2, Earth 3, Mars 4, the asteroids 5, Jupiter 6, and so on. The semimajor axes of the orbits have been plotted versus each planet's number. For the asteroids the dot is Ceres and the bar represents the range of semimajor axes in the main belt, a concentration within the broader asteroid belt. The curious thing is that, with a logarithmic scale on the 'vertical' axis, the data in Figure 1.10 lie close to a straight line. This means that the semimajor axes increase by about the same factor each time we go from one planet to the next one out. This is one of several ways of expressing the Titius-Bode rule, named after the German astronomers Johann Daniel Titius (1729-1796), who formulated a version of the rule in 1766, and Johann Elert Bode (1747-1826) who published it in 1772. Theories of the formation of the Solar System (Chapter 2) can give rise to an increase in spacing of planetary orbits as we go out from the Sun, so the Titius-Bode rule is an expression of this feature of the theories. Figure 1.10 The semimajor axes of the planets versus the planets in order from the Sun: 1 = Mercury, 2 = Venus, etc., until 10 = Pluto. The vertical line at 5 is the asteroid belt. theory is encapsulated in Newton's laws of motion, and the other in Newton's law of gravity. I state these laws here on the assumption that you have met them before, and will concentrate on using them to explore motion in the Solar System. and the direction of the acceleration is in the direction of the unbalanced force. Newton's third law of motion If body A exerts a force of size F on body B, then body B will exert a force of the same magnitude on body A but in the opposite direction. Newton's law of gravity If two point masses M and m are separated by a distance r then there is a gravitational force of attraction between them with a magnitude given by where G is the universal gravitational constant (its value is given in Table 1.6). (1) The only force on a body is the gravitational force of the Sun. 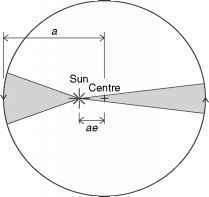 (2) The Sun and the body are spherically symmetrical. This means that their densities vary only with radius from the centre to the (spherical) surface. 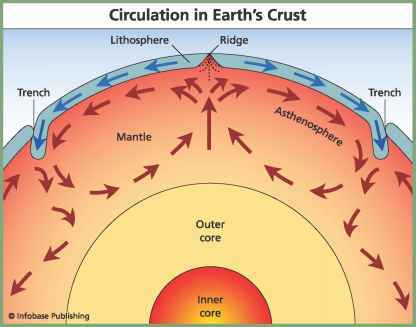 In this case they interact gravitationally like point masses with all the mass of each body concentrated at its centre. (3) The mass of the orbiting body is negligible compared with the Sun's mass. The detailed derivation of Kepler's laws from Newton's laws can be found in books on celestial mechanics, and will not be repeated here, but we can illustrate some links between the two sets of laws.